Finances are taken care of by accountants. What they do is record and report on the financial status of their clients. Entities from individuals to corporations can acquire the services of accountants. But more often than not, their clients are big businesses and companies. If you have a degree in accounting, and if you have already passed examinations that certify you to practice in the field, then finding job opportunities is not difficult. The quickest of searches immediately direct you to a number of openings. The challenge now is for you to be able to land one, and to do so you need to make the most compelling applications. 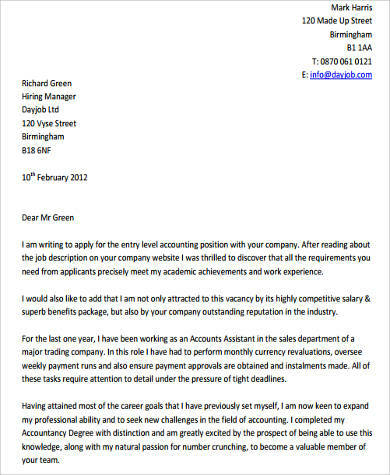 Consider introducing your resume with an effectively written cover letter. 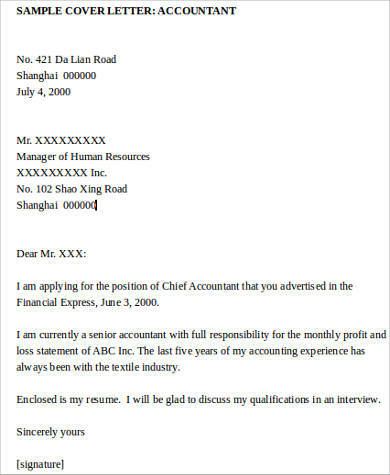 For starters, see Sample Cover Letters. 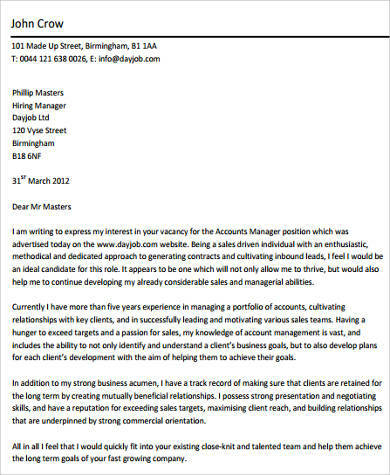 tell your interviewers why you deserve the position you are applying for. It should therefore be addressed accordingly, have a professional format, and should be in print. Most importantly, write everything in a concise manner. 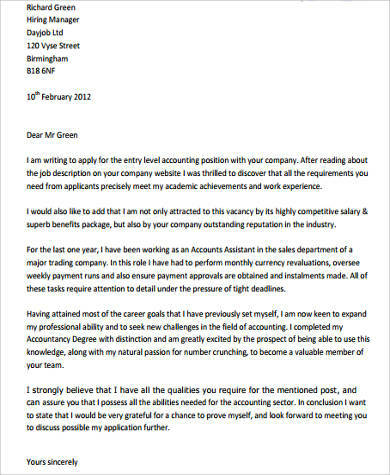 Be guided with these Sample Job Cover Letters. Accountancy is a practical field. Focus your resume and cover letter on your experiences, your academic achievements, certifications, and awards. 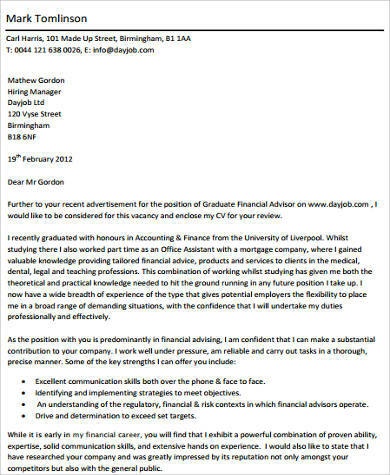 You should also highlight internships to accounting firms. 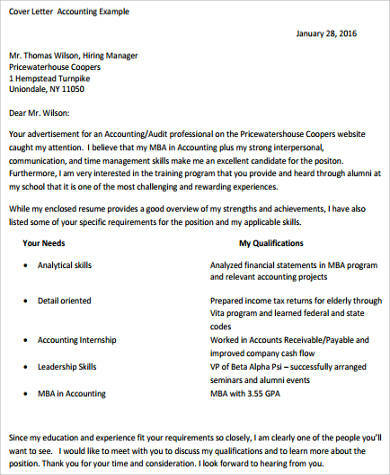 If you are still an accounting undergraduate gunning to intern at an esteemed firm, see these Internship Cover Letter Samples. Academic qualifications. This includes a bachelor’s degree in accounting, and preferably with further studies. Certification. One must also be a passer of the required licensure examinations. 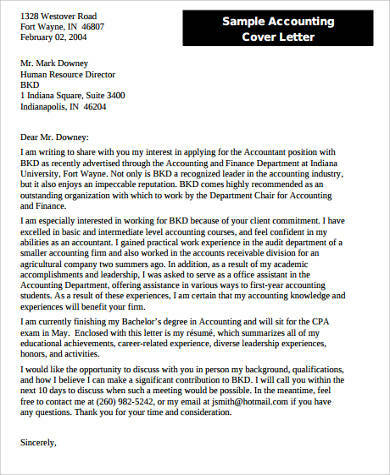 An applicant who only has a bachelor’s degree, or has yet to take examinations, might take on rank-and-file positions as assistants to accounting practitioners at firms. Accuracy. On a daily basis, accountants deal with figures and statistics important to the functions of entire corporations. Accountability. They should be exacting with their numbers, and their accuracy must trickle down to the last cent. A single discrepancy in their work, could ripple to problems in broader operations; and even the difference of a single coin puts everything into question. Client-focused. Accountants in big firms handle the finances of clients from different industries. The best accountants are said to be those that work according to the specific needs of their clients. Team player. There are accountants that practice on their own, but by a landslide, the larger majority work in firms or are within companies and institutions. They should therefore be able to work harmoniously, most especially when they have to work in groups. Assess your own qualifications according to the ones potential employers are looking for, because the objective of your cover letter is to parallel the two. 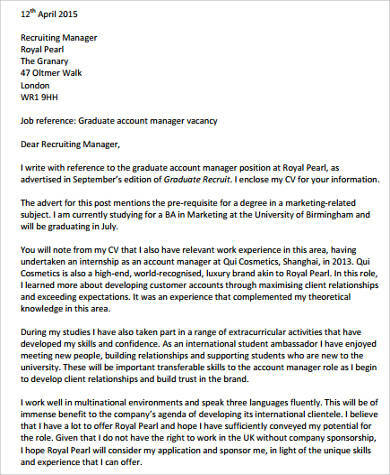 As with these Basic Cover Letter Samples, you should be able to convince the company you are applying to that you have good knowledge of their work, and that you can contribute greatly to this.